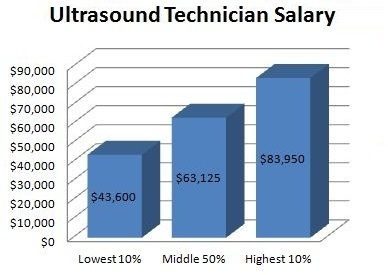 The Ultrasound Technician Salary ranks among the highest salaries of all medical technician fields. In fact, Glassdoor.com named Diagnostic Medical Sonographer as the 2nd best high paying job you can get with just an associates degree, and U.S. News also ranked it on #3 for the best healthcare jobs in USA. The average Sonographer salary is $68,900 Annually which is around $30 Per Hour. The top 10% ultrasound technician earns $100,000+ and the bottom 10% earns $40,000+ according to the Bureau of Labor Statistics. Ultrasound technician has really high earning potential, which is combined with great employment outlook of 48% and this is why career in sonography is a popular choice in the medical world. A Diagnostic Medical Sonographer, Popularly known as an Ultrasound Technician or Sonogram Technician, uses sonography to assess and detect the existence or lack of a prevailing medical condition. As a Sonographer, the health specialist focuses sound waves on a particular part of the body to create images of the soft tissues to help and come up with an overall diagnosis. They play an important part in the diagnosis process. It is through their findings that Physicians are able to make well informed decisions about the patient’s health condition. With the Increased demand for Ultrasounds as opposed to X-rays, the field of sonography promises a bright future with great ultrasound technician salary as it continues to grow at an increasing rate. Sonographers can work in various places; from hospitals to physician’s offices and even holding management positions. Their skills work hand in hand with physicians making them an important part of the equation in improving the patient’s health. Given its varied use in forming a conclusive diagnosis, ultrasound technicians can specialize in performing sonography on specific parts of the body. For any individual considering joining the field of medicine, choosing sonography promises a bright future, endless possibilities and great ultrasound technician salary. With the right educational background coupled with work experience, you cannot go any wrong. Like any other medical profession, for one to become a qualified and skilled Sonographer to earn good salary, one must get the proper training. How to find a Ultrasound technician school near me? Well, Identifying a school that will be able to offer you the best hands on teaching experience and also build on your knowledge is vital. They play a crucial role in the diagnosis process, certification is required by most if not all employers. Learning in a certified institution also ensures that you meet the markets requirements making you a better candidate for employment with good ultrasound technician salary. There are huge possibilities of career growth and employment and also the advancement in upcoming years according to BLS (Bureau of Labor and Statistics) in USA. The number of technicians are expected to increase by 48% which is more than 58,000+ Certified and Registered Ultrasound Technologists in USA. Depending on the learning path you choose, many schools in the USA offer courses at Associate Degree, Bachelor’s Degree and Master’s Degree level. So, If you wish to study to become an ultrasound tech, you can either opt for a regular or online method of learning. The regular mode of learning is where you attend class physically on a daily basis. How Do You Become An Ultrasound Technician? The road to becoming a ultrasound technician demands commitment and hard work. For starters, you must have a high school diploma or a GED. These are the minimal requirements for applying to any institution that offers the course. A good background in the mathematics, biology and physics is important as these are the core subjects in sonography. The second step is completing an associates degree or bachelor’s degree in diagnostic medical sonography from an institution that is accredited already by the Commission on Accreditation of Allied Health Education Programs Or CAAHEP. Like any other career, work experience plays an important role in amassing knowledge about the specific field. Clinic experience enables the student to apply the knowledge learnt in class and also get a better understanding of sonography. Professional debates also offer additional training to students. For any student, it is also advisable to take the American Registry for Diagnostic Medical Sonography Or ARDMS Exams. By being Certified, this will increase your possibility of getting employed with best ultrasound technician salary. After observing all the necessary steps, start looking for jobs that meet your skills. Such jobs are available in hospitals and as well as physician offices. With the right qualifications, you can easily find your dream job! Education is Power. This is no different in the case of sonography. Education is imperative and based on the level that you wish to achieve, so will the time required. The Medical field offers a flexible learning opportunity. For individuals already in the health sector and wish to branch into sonography, a certificate in ultrasound technology will help them get to the next level. Seeing as the individual already has a background in the health sector, the certificate simply adds on to their knowledge. It focuses on the introduction to sonography and its applications. A hand on approach is also used at this level to give the student a better learning experience. Associate’s Degree – In the case that you opt for an associate’s degree, it takes less time than a bachelor’s degree and offers a good starting point for any student. An associate’s degree takes two years saving you the extra two years taken in a bachelor’s degree. A student should expect to acquire clinical experience as it is part of the course work. Courses commonly covered under the associates degree are; clinical pathology, sonographic physics and vascular sonography. In some instances, the student may be required to show a good understanding of the core subjects such as math, physics, biology and the humanities. Furthermore, students are encouraged to have prior understanding of the health sector so as to aid them in their course work. Bachelor’s Degree – The bachelor’s degree takes four years. The four years of learning award the student with a deeper understanding of the study. Under the bachelor’s degree, the student can focus on diagnostic medical sonography, cardiovascular sonography and abdominal sonography to name a few. Master’s Degree – Master’s programs are also available to those who wish to further their education. By doing a post graduate, you become eligible for administration and management positions. It is therefore useful for individuals who are eyeing management levels. A master’s degree can also be acquired for specialisation purposes; that is focusing on a specific part of the body or organ. When deciding on the right program for you, steer clear of institutions that offer 4 to 6 months training. They are not only accredited but also do not impart the necessary knowledge. Moreover, it is advisable to learn as much as possible about the courses offered by most if not all schools that offer ultrasound technology. In the event that you choose a school that does not offer your line of specialization or interest, you will be at a great loss. Every institution has a certain course for which it teaches well and has specialized in. Ensure you get the best learning experience from your institution of choice. The United States Labor of Bureau Statistics Estimated a 48% growth in the field of ultrasound technology between the years 2018 to 2023. In the year 2018 alone, we expect a 16% growth in this field making it the opportune moment to join the practice. This promises a bright future for all. Advancements in technology coupled with increased demand for Sonogram technician have led to the positive estimates. As technology improves, They are able to use these ultrasound machines to better their skills making them more reliable and accurate. This has also led to the reduced demand for x ray machines due to the exposure to radiation. Specialization has also played a critical role in creating more demand for Sonogram technicians. Through specialization, any one can prove to be more viable in his or her field. This in turn leads to increased wages and increased demand for their skills. The aging population in the USA is also one of the push factors for the positive job outlooks for ultrasound techs. As individuals continue to age, there is more demand. Sonographers are also expanding their offices from hospitals to physicians offices and imaging centres making them a targeted commodity. The main duty of a technician is patient care. After receiving a patient, the diagnostic medical sonographer is required to explain the procedure to the patient and tell them what is required of them. The Ultrasound technologist will then use his equipment to look at the subject’s internal organs or soft tissues. After that they apply their knowledge in human anatomy and physiology to detect any abnormalities. The patient is usually awake when the procedure is taking place giving both parties to discuss and clarify what is going on. This therefore requires a sonographer to have good communication skills. Body strength is an added advantage to a sonographer seeing as they work with all sorts of patients – from elderly patients to young individuals who may be badly injured- and they tend to work alone or only with the assistance of one nurse. In the case where the patient’s condition cannot allow him to come to the hospitals, It is a duty of a Sonogram technician to go to them. Seeing as some machines are portable, the sonographer can easily move from one workspace to another. They use their expertise to analyze the results and make proper recommendations to the physician. The images and recommendations will then be taken to the physician. As of 2018, the average ultrasound technician salary is $68,900 Annually. The salary however will vary on a number of things. For starter, more experience in the field of sonography will lead to a higher wage rate. This however, does not necessary mean that beginners do not have good salaries. For an ultrasound tech with a year’s clinic experience, you can expect an average Sonographer salary of $39,340 per annum. This salary will continue to grow up to an average of $60,462 annually to individuals with one to four years experience and up to $75,700 to technicians with eighteen years experience. One of the key factors therefore, is to increase your work experience is order to increase your ultrasound technician salary in USA. Specialization in a certain field of sonography can also help increase your ultrasound technician salary. This is mainly due to the competitive demand of the lack of certain specialists. For example a Cardiac Sonographer Salary is $68,000 while a Vascular Sonographer Salary is $48,000 per annum. This clearly indicates that some areas of specialization will offer a better payoff than others. Location is another imperative factor in an ultrasound technician’s salary. Cosmopolitans will offer better salaries as compared to rural settings. How Much Does An Ultrasound Technician Make? With a National Median of $68,900, technicians in the states named above earn an extra $20,000-$40,000 on top. Therefore, if you aspire to be a technician, it is vital to look at your area of study, the job offers and also the salaries offered to Sonographers before committing to a specific location. Generally, being an ultrasound tech offers a good salary compared to other fields in the medical world and given its projected growth rate of 48%; you can expect increase in ultrasound tech salary as time progresses. If you are doing that brings you joy, why not make the most out of it by earning a good ultrasound technician salary. To Increase your ultrasound technician salary, there are several things one can do. For starters, you can specialize in a certain field. By specialization, you make yourself a, valuable and important asset in the field of sonography. An example of a good area of specialilization is fetal ultrasounds. It is safe to say that people will continue to bear children and for this reason the need for such expertise will be there. Mothers-to-be will need to check the progress of their unborn child throughout their pregnancy. If you seek a challenging perspective in the field of sonography, the field of research and development will not only quench your thirst but also increase your salary. Opportunities to improve the field of sonography are there in plenty and will continue to offer better solutions. You can also opt to teach students at local institutions part time or full time as a way of increasing your ultrasound technician salary in 2018. Management and administrative positions are also available to sonogram technicians. These positions are usually open to technicians who have good work experience and/or have furthered their studies. An administrative position leads to an automatic pay increase as your role become to supervise and coordinate fellow medical Sonographers in a hospital or imaging centre. In UK, You can expect to Earn 20,500 to 60,500 Pounds per year. These salaries will vary due to work experience, area of employment and also level of education. For this reason, an ultrasound technologist located in a UK hospital earns a sonogram technician salary of 26,050 to 40,050 Pounds annually. Those employed by the government, earn approximately 28,050 and 40,050 Pounds annually. Those working in the private sector can expect a higher ultrasound technician salary ranging between 31,010-47,010 Pounds. In Australia, the earnings per hour vary between AU$28 and AU$59. The hourly salary is also influenced according to many factors such as location, experienced etc. In Canada, technicians earn CAD$65,010 to CAD$75,010 annually with the highest earning CAD$42 an hour. In all three countries, ultrasound technician salary vary due to location, work experience and educational background. This is the same case as in the USA. Generally, Sonogram technician in these three countries receive good salaries as those in the US. With a projected growth of 48%, one can expect huge increase in average ultrasound technician salary. The increasing demand will see an increase in hourly wage rates in most areas of the country. States that offer high wages such as California and Oregon to name a few will be expected to see the highest rise of ultrasound technician salary in USA. For States with lower annual wages such as Alabama, they will have an increase in salaries but the effect will not be felt as those in urban areas. It is evident that location plays an important role in the amount of salary paid. For those who wish to increase their ultrasound tech salary, you can move to a state where the wages play to your advantage. Work experience, Educational background, increase of work opportunities are just some of the factors that promise a positive increase in sonogram tech salary. With the right information, it is possible for any individual to increase their earnings and advance in the field of sonography. If you want to earn ARDMS credential, you must complete ultrasound tech educational requirements (Normally A 2-Years Associate’s Degree or A 4-Years Bachelor’s Degree in sonography program from an accredited school) and you should have 12 months of full time clinical ultrasound experience as well. How Many Years Does It Take To Become An Ultrasound Technician? Most People hold just an Associate’s Degree, which typically takes 2 years to complete. What Is The Starting Salary For A Ultrasound Technician? Diagnostic Medical Sonographers, operates machines called sonographic scanners that creates images of patients internal organs. Main Job duties includes – Explain the ultrasound procedure to patient and answer any questions they may have. How Much Money Does An Ultrasound Tech Make Yearly? An Ultrasound techs earned an average $68,900 annually as of Janauary 2019, according to the BLS. Are Sonographers In High Demand? According to the Bureau of Labor Statistics (BLS), the employment of Sonographers is projected to increase by 48% between 2018 and 2023. What Is The Ultrasound Tech Salary Hourly? The lowest paid 10% received $21.61 per hour. The highest paid 10% made $43.58 hourly. In The End, A career as an ultrasound tech is one with many promises. As an ultrasound technician, you have the ability to climb the medical ladder and become the best in your field. The current demand also indicates a bright future for great ultrasound technician salary. Choose a future that promises an opportunity to excel. Why Ultrasound Technician Is A Great Career Path For You?